Indianapolis, IN (Jan. 18, 2016) – Chip Ganassi’s team has won six of the last ten Rolex 24 Hours at Daytona, including last year’s race. This year, Ganassi will run four cars in two categories at Daytona. A pair of Ford-powered Riley Daytona Prototypes will go for the team’s seventh overall victory and Ganassi’s team will also debut two of Ford’s new GT cars in the GTLM category. Ganassi’s Ford GTs will compete in both this year’s Weathertech IMSA series in the USA and the World Endurance Championship. In the past Ganassi has run just one Daytona Prototype for the full IMSA season and two cars at Daytona. So his team has been gearing up for a big job to run two Daytona Prototypes for the last time and launch the Ford GT program which will be the IMSA team’s primary effort this year with two cars in all the races. I talked this week with Ganassi’s general manager Mike Hull about the team’s preparations for Daytona. 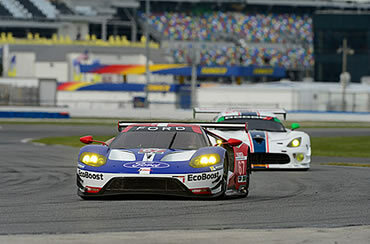 “The Ford GT project is a doubling of the effort we’ve had for the last several years in the IMSA series,” Hull said. “It’s a doubling of everything – transporters, pit and garage equipment, manpower, plus increasing the depth of resources internally to support the program without having it crowd any of the other projects we do here in Indianapolis in any way whatsoever. “So the programme stands on its own feet. It’s factory-supported, which is terrific. Ford’s been a great partner from the very beginning two years ago on the Daytona Prototype program and have moved fluidly into the new Ford GT project. “Over the winter we’ve worked on doubling our IMSA team and resources to supply and support that effort. We’ve had a terrific winter of testing but of course it’s a big challenge when you start the season at Daytona with the biggest, most-demanding race of the season. “We did several tests starting in September all the way through December. The tests were structured to be about long-distance running. We ran a couple of simulated long-distance races and we worked really, really hard to break the car. We also worked on what became the homologated spec of the car. So we had many long days and nights at the racetrack with the race car, which is what you face when you go endurance racing. Mike O’Gara runs the Ford GT program for Ganassi in the USA. O’Gara has run Ganassi’s IMSA sports car team for the past few years. Ganassi’s IndyCar team manager Barry Wanser is in charge of the Daytona Prototype program for Daytona with last year’s winners Scott Dixon/Tony Kanaan/Kyle Larson/Jamie McMurray leading the team at Daytona. Most of Ganassi’s IndyCar mechanics and engineers have been working on the Daytona Prototypes over the past few months. “Everybody seems to be in agreement that there’s not enough for our IndyCar guys to do when the season ends in September,” Hull remarked. “So we decided to put most of our IndyCar staff onto the two DP cars. They’ve been gainfully employed through the winter preparing the DP cars to race at Daytona. We turned the Daytona Prototypes over to them when they came home from Sonoma last September and they’ve been busy ever since. We had a great test at Daytona and it’s all been working quite well. “What’s really good about that is they’ve been working together as a race team over the winter before we go testing and racing again with the Indy cars. At the Rolex 24 Hours they’ll again be working together as a team in the pits behind the wall and over the wall. Hull described Ganassi’s approach to the Rolex 24 Hours. “You stop for fuel every fifty minutes or so at Daytona so you’re really trying to manage 24 different segments of the race,” he observed. “In order to win the race you have to get to the last segment and that’s hard to do! “Rather than looking at our competition we look at what we’ve done in the past, the history of the race, and how to improve our program. What did we do in the past at 1am, or 4am, or when the sun came up on Sunday morning? It’s all about setting yourself up to be ready at the end of the race. Each driver has to hand the car off to his team-mate in as good condition as it was when he started and he’s got to provide sufficient information to the team about what the car needs next. “You’re always prepared to find the opportunity to come into the pitlane because of yellows. That allows you to sharpen your car and that’s what you’re trying to do all the time. You’re trying to make your car slightly better for the conditions. “You have to remember that the Daytona track changes tremendously over the course of the race. You start in the middle of the afternoon and the track is relatively good. But when the sun goes down the track really comes to life. About 4 or 5am the fog often comes in and the moisture gets on the surface of the track and the grip goes away. And then the sun comes up and the moisture burns off and the track comes to life again. “So you have to be prepared for that. You have to be cognizant of those things so you can chase the racetrack and be ready at any time to sharpen your car in the pitlane. You’ve got to be ready for those things through each and every segment of the race. Over the past 20 years Ganassi’s team has established itself as one of America’s strongest, most broad-based teams. This year Chip and his band of brothers hope to add another Rolex 24 win to their resume and to further expand their reputation across the United States and around the world with Ford’s new GT car.